The Blue & Grey Series are American Civil War games that allow players to refight campaigns in 2 hours. The first 3 volumes in the series portray the campaigns in Virginia, Maryland, and Pennsylvania between 1861 and 1865. The short series rules will have gamers playing in 30 minutes. The game specific rules have details critical to each of the campaigns. The 3 volumes have linkable maps allowing all of the great campaigns in the east to be refought. Low unit density and reaction movement means high player interactions and no down time in the game turn. Each game comes with game map, battle board, blocks in blue and gray, labels, dice, series rules, and game specific rules. 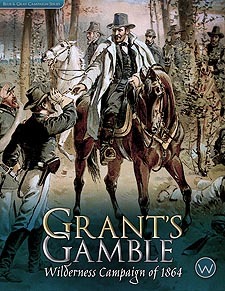 Volume I - Grant's Gamble follows the 1864 overland campaign of Union General Grant from the Wilderness to Petersburg. With the election of Lincoln hinging on Grant's success, as Confederate General Robert E. Lee can you keep your army intact and Grant out of Richmond? As Ulysses S. Grant can you wear down the Confederate army and capture Richmond and Petersburg ending the war and saving thousands of lives?